Prepare potato. In a skillet, add 2 tablespoons of olive oil and sauté onion until golden brown and caramelized, about 10 minutes. Set aside to cool. Heat oven to 400°F. Coat potato with olive oil and sprinkle salt over entire potato. Place potato on pie tin or baking sheet and cook for 35-40 minutes (depending on the size). Bring steak to room temperature. Liberally sprinkle salt and pepper on all sides of steak. Heat a 10-inch skillet (or one that accommodates steak) to very hot. Add 2 tablespoons cooking oil. 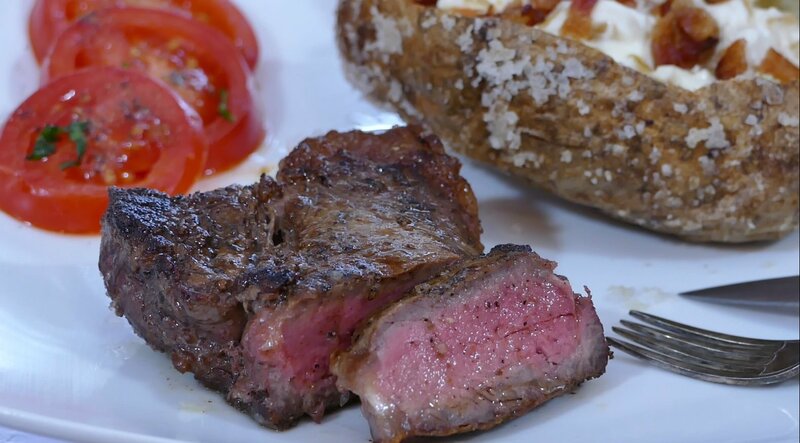 Lay steak in skillet and do not move it. Cook about 3-4 minutes per side to sear. Only turn steak once if possible. Use cooking guide in video for doneness, or use meat thermometer (do not poke many holes in steak.) When done, slather 1-2 tablespoons of butter over top and let steak rest for 5-7 minutes before slicing. Mix onion and sour cream together. Cut open potato and spoon onion sour cream over top. Garnish with bacon bits.